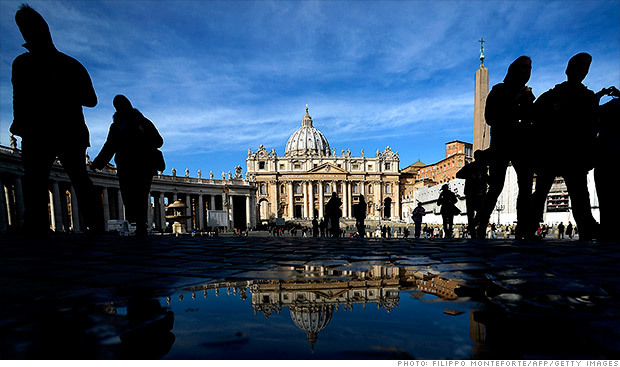 LONDON (CNNMoney) - The Vatican has sidestepped EU banking rules by turning to a Swiss company to restore card payments in its museums after they were suspended over concerns that the city-state was not doing enough to prevent money laundering. The church hierarchy refers to the Pope as 'Holy Father', while the Word of God teaches us to call no man your (spiritual) father upon the earth (Matthew 23:9). The Pope was never appointed or ordained by God but rather by men and a quick study of the Papal Office will confirm that it is not 'Holy' at all. Click the report abuse link to get rid of this troll..
"while the Word of God teaches us to call no man your father upon the earth" . The pope of the Roman Catholic Church is not the only minister who goes by that ti.tle. The patriarchs of the Eastern orthodox Church and other Churches which have Patriarchs use that ti.tle for their Patriarchs. He is not the Holy Divine Father. He is the Patriarch of Rome and as such honoured by the ti.tle Holy Father like all other Patriarchs of the Church just as a priest is called Father or Reverend Father. The Vatican side-stepping laws in the name of money? Business as usual. Hypocrites. Marvin Plurkin, hamster trainer of the stars! The Vatican had to stop taking credit cards because of money laundering? Anyone who thinks Catholicism is a source of morality and righteous living really isn't paying attention. That's been clear for some time. Excellent! Time to invest in companies that manufacturer plastic jesuses and other catholic believer tourist souvenirs.